Guacamelee! 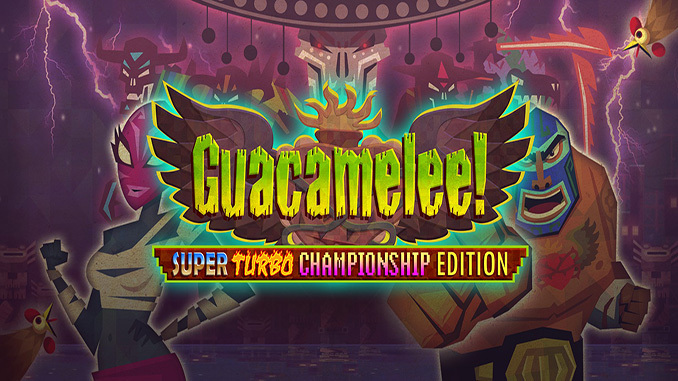 Super Turbo Championship Edition is a widely revamped version of the original Guacamelee!. Enjoy exploring two huge new levels, exploding into ‘Intenso’ power mode, and laying egg bombs as a chicken. You’ll need every bit of power to dispatch a vicious new class of Elite enemies, a host of updated and rebalanced challenges in Normal and Hard modes, and the scheming new boss, El Trio de la Muerte. – Drop in/out 2-Player local co-operative play, featuring independent dimension swapping. – Non-Stop Fighting Action. An extensive move list, advanced combo engine, and anti-gravity grabs. – Multiple boss characters (each with unique back stories), wide range of foes, and elite-class enemies. – Spectacular player abilities: The Rooster Uppercut, Frog Slam, and “Intenso” turbo-combat mode. Windows 7 / 8 / 10 / XP / 2000 / Vista, Processor: 2 Ghz+, Memory: 512 MB RAM, Graphics: Shader Model 3.0, 512 MB VRAM, DirectX: Version 9.0c, Hard Drive: 800 MB available space. Which one is the newer one? I see a super turbo and a gold edition? hi, my game keeps crashing after installation. whats that about?